This entry was posted in Miscellaneous and tagged Tuna Can, Vocaloid, Zig. This entry was posted in Miscellaneous and tagged Hyda Mio, Kanzaki Iori, Vocaloid. Hello! Trying something a bit new for this blog because I’ve been hit with unforeseen expenses this month (medical treatments and prescriptions). I’m opening limited translation commissions. Details under the cut! I’ll be putting a page up with the same details about commissions that I can use in the future to open and close, so this post is just going to become normal. You can still reply to this post but it’d be better to head to the page! Thank you! Uh, so I’m a dum-dum who missed her own blog’s anniversary (WORDPRESS DIDN’T REMIND ME!) and that clearly tells you how busy I’ve been lately or just so zoned into queuing things to next year that I completely forgot about this LOL. Anyway, I’m backdating this to the actual anniversary date so I don’t forget it for future reference but I’ll sticky this post to the front page for a while just so everyone can see this message. Unfortunately, I didn’t prepare anything for this year’s giveaway so it’ll just be a short message about me and my blog. Between last year and this year I’ve done a lot more translations (though it looks like I started SNB before my 6th anniversary) and that’s been interesting and time-consuming in its own way. I’ve also done a heck ton more drama CD translations this year. I’m almost freed from my light novel translation though (it’s going into 2 years!!) and I’m catching up to the latest chapters in SNB… WILL I BE FREE TO PLAY GAMES FINALLY!? I have such a ridiculous hoard of otome games it’s not even funny now and I’m really missing them LOL. But, jokes aside, I’ve enjoyed these translation projects and they really helped me develop a translation style for myself as well as truly understanding the age-old debate of literal vs. liberal translation and the gradient of these two sides. I don’t know what the future has in store for this blog but I’m not quitting it any time soon either so that’s something! Hopefully, I’ll get to put up game posts again between this anniversary and the next. And a huge thank you to everyone who visits this blog too by the way! I remember when traffic was super quiet at the beginning (back in 2012 LOL) but now I’m seeing regular commenters and it’s just fun stuff! On a side note, and I had to check the dates for these, but I took the N2 in December 2017 and the results that were released in January 2018 showed that I passed! You may have seen me yelling on Twitter about it but that’s something to report between this blog’s last anniversary and this anniversary. I AM AN OFFICIAL N2!! With no formal lessons in Japanese!! I passed by self-studying through playing games, listening to drama CDs, and reading light novels and web novels LOL. More about my N2 experience will be under the cut. This entry was posted in Miscellaneous and tagged Anniversary. I remembered there’s a true convergence in Uesugi’s chapter 9 with Takeda so we’re bumping up the voting schedule to have the overall story read better when everyone else catches up after Uesugi’s chapter 8. IIRC there’s a convergence with Takeda and Sanada too (I’m just drawing a blank at where it is exactly) so regardless of which army wins I may jump over to the other one sooner rather than later. Mouri is safe to continue all the way to chapter 4 though. Anyway, go, go, toss your votes for the next army! I’ll be closing this poll once I post 8.5 of Uesugi. EDIT: So the winner is Takeda Army! We’ll be starting with them after a quick detour to Date’s ch10 (horribly timed considering the mess they made in Uesugi LOL). Oda + Toyotomi events. There’s the volcano event (both armies), the moonlit poets (Oda), and then the latest one (Toyotomi) which I haven’t updated the page with yet. I’d be doing all three if this choice is chosen. Or we can move into another army entirely! The choices here are either Uesugi or Date next. Please vote with your money love to help me decide (I am but a lowly translation slave– jk jk)!! Poll is closed and THE DATE ARMY IS THE WINNER! Holy moly time is flying by too quickly!! I can hardly believe we’ve reached 6 years on this blog already; there’s this weird sense where I feel like I’ve posted nothing at all but also posted a truckload. I almost wish there was a total word counter to see how many words I’ve written altogether… on second thought, maybe not, because I know my first Beyond the Future post nearly broke 100,000 words LOL and I don’t want to see the sad total. Also, what the heck happened to my blog. Where’d the games go!? LOL. I was trying my best to beat Aksys localizations and play the JP versions before the ENG ones came out but that soon became a pipe dream. They localize faster than I can play because I keep getting distracted with other projects, wah. I will return from the war one day!! But in my defense everything is still geared towards otome!! It’s just become a blog encompassing different media :’) so thank you everyone for putting up with my eclectic posts. I always say this but wow my Japanese has improved so much. It’s really nostalgic looking back at my crappy posts and the games I started out with– oops, I probably shouldn’t have brought that up because now some of you may be tempted to look back at my sordid history (please don’t!). On a serious note, a huge thank you to everyone who’s followed me up to now and a warm welcome to the new people who have decided to follow my blog! I do recognize the names of people who comment lots so don’t think I don’t see you coming and going <3! Anyway, as per tradition, I’ll be hosting a giveaway again. Anyone is free to participate as long as they fulfill the rules condition (don’t worry, it’s super easy). Once again, thanks for visiting my blog and I hope to see people around again next year! EDIT: The winning numbers are 389 and 17 (nice the number generator spread it out!) and the two closest to those numbers are Sumi (46 number difference with 435) and yaoidaisuki (4 number difference with 21). Thanks to everyone who participated and shared their biases ;3; I loved hearing about them! I seem to be writing more and more of these short review things but THIS WAS TOO GOOD OF A STORY NOT TO TALK ABOUT!! It also has romantic elements in it so… I’m still keeping to my blog’s theme of otome games, right? LOL. Seriously though, I have to write my thoughts down to find release and I hope in doing so I can convince some people to try this game out. I’m going to try my best not to spoil anything (this game is best when going into it blind) but some analogies and references I make might hint at things so proceed past the read more at your own risk. 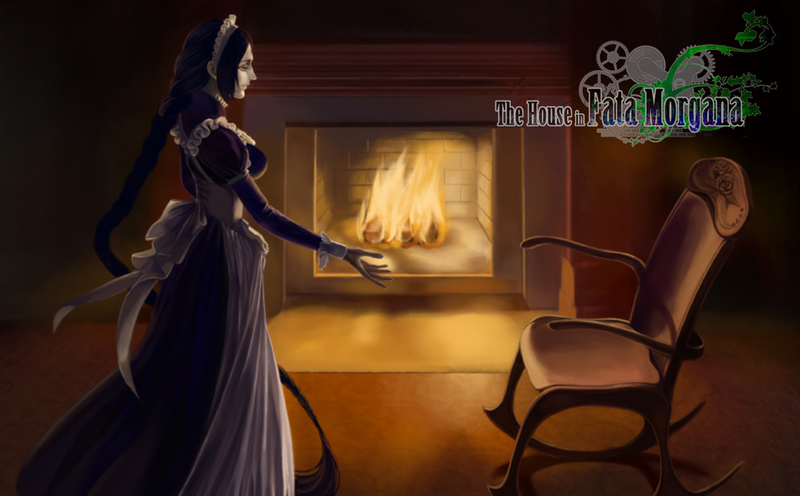 First though I’m going to talk about my general thoughts about The House in Fata Morgana. I found it to be a story that nails the delicate balance between despair and hope. You’re given happiness and then it’s ripped away, but when you’re in despair you’re given a reprieve in hope and happiness. Fata Morgana is a story about how humans and the unshakable principles that make each person unique can lead to tragedy; but it’s also a story about how every human has the capacity for resilience, hope, and forgiveness, and how those can make a difference. I think, ultimately, it’s a story about humans in all their messy and glorious humanity and the connections – and influence – we can have on each other (and it’s also a story about how perspective is everything). TL;DR: Fata Morgana takes you to the terrifying depths that humans can fall into but it will also lift you up with displays of the human capacity to connect and support each other. It’s a very well-done story with despair and hope that ends on a beautiful and uplifting note (which is what these kind of stories need, imo, otherwise you’d just crush your readers with all the tragedy LOL). I do have some criticisms though. The pacing can be a bit off at times such as giving massive backstory on characters when, at that point, you have no idea why you should care or what you should even take away from it. Also, I don’t know if this was a localization issue or not but on a technical standpoint the writing can be a bit bland for a gothic suspense/horror/romance story. HOWEVER, the craft and entirety of the story is masterful. Everything is placed in the game for a reason (the game answers everything) and it’s amazing how many layers this story has. At one point you end up reading the same scene three times but this happens after you gain additional knowledge each time which warps your perspective of that scene and it just. blew. my. mind. This entry was posted in Miscellaneous and tagged Novectacle, PC. SERIOUSLY!? Already!? It’s been another year and this blog is still plodding along ヽ(*´ー`*)ﾉ! Much love and thanks to everyone who has continued to follow this blog (and those have just recently joined me on my otome adventures, or who drop by occasionally). I don’t have much to say this year other than that I have a job now!! I’m also in a better place mentally and personally now that I have more of an idea of what I want to do in life, and have projects going on, so financially and emotionally things are going pretty well (I hope saying this out loud doesn’t jinx everything LOL). Now I’m sure you’ve all been waiting for this since it’s slowly becoming a tradition but, yes, I’ll be hosting another giveaway! This year there is not just ONE but THREE prizes! But this also means I’m going to devise a really hard challenge– kidding kidding. It’s not a hard challenge but I am changing things up a little from the usual number generator thing. Lope (this game sounds terrifying but these lines got a chuckle out of me “descend straight into crazy town” and “therapy your way to love”). Honestly, this was hard for me to decide because I laughed at a lot of entries. It took me half the day to decide on 6 favorites and then another half day to come down to these three. THANK YOU ALL FOR PARTICIPATING THOUGH!! I was smiling a lot when reading these entries and thank you for the well wishes to this blog as well <3. Here’s to hoping for another great year! I will be contacting the winners by email. I intended to post this when I completed Psychedelica but I was too impatient (which seems to happen a lot, oops). First, I’d like to apologize for my sporadic updates though ;;; I was stuck in Japanese light novel hell and lately I’ve been stressed and distressed with job hunting. But enough about me and my excuses, I wanted to connect with my readers and ask a few questions about the kind of things you’d be interested in seeing on this blog, etc. Posts on localized games? Norn9, Code:Realize, Hakuouki, and OZMAFIA have come out (or are coming out) and so I don’t see the need to translate/summarize them like I do for other games; however, is anyone interested in seeing an “impressions” or “review” post on localized games? Or should I just quietly play it? Light novel translation? I mentioned above I was trapped in LN hell and, as a result, I read this REALLY GOOD BOOK that I’d love to translate. Once again though, is that something people would be interested in? I’ll most likely put more time into playing otome games though and just occasionally do chapter translations. Commissions? When I started this blog it was just a hobby and I wasn’t confident enough in my Japanese to feel like I could provide a service for people, but I’ve improved a lot since then and if people are interested then I wouldn’t mind taking drama CD translation commissions (I’d be open to other translation commission requests too!). That’s pretty much all the important questions I wanted to ask. But if you have any concerns, questions, or feedback you want to leave then please comment below! By the way I’ve been thinking about making the first post on a game to be a translation/summary of everything up to the first choice. Would that be annoying or would it be a nice way to get a sense of the game and be teased? One last thing! I can’t decide on what I should play after Psychedelica, so please help me out by voting! I should be done Psychedelica within the next few weeks or so (there’s only 3 more posts left). I wish I could have put some Beast Master and Prince posts up while the kickstarter was happening but it’s still a cute game that I’d like to share with people (especially if the kickstarter doesn’t go through ;;;;). POLL IS CLOSED. THANK YOU! Oh, wow, time sure flies by fast. It’s been four years already since I started this blog! I’m also noticing that I have fewer and fewer posts between my anniversaries, oops. Life has just been really busy for me now that I’m not a student and trying to figure out what I want to do with my life (you know, adult responsibilities and stuff). As always I’d like to thank everyone who has stuck with me and all the new people who have subscribed to this blog (or check back on it regularly) too despite my frustratingly slow posts. I’d like to talk a bit about the future of this blog too. Don’t worry, it’s nothing bad! I want to reassure everyone that this blog will always be here for as long as WordPress allows it and that I’ll continue to upkeep it too to make sure that all the images are here; and, at this point, I’m still interested in otome games so I’ll still continue to blog away at my slow pace. I’ve asked my readers about my posting style before in previous anniversaries and the overall majority seems to enjoy my super long posts (despite the slow speed) so I’ll continue to do that. But I am thinking about changing my posting style a bit. My games seem to lean towards being story-centric which feature either episodes or chapters, so I’ve been thinking about posting chapters as I finish them to increase my posting speed and decrease the waiting time for everyone. I’d like to hear what people think about that! Yes? No? Would you rather have really long and big posts when I finish a route or chapter by chapter? Characters will still have their own posts for their routes that will include all their endings though. At any rate, let’s move onto the fun part now! I will be giving away ONE DRAMA CD TRANSLATION and ONE COPY OF AMNESIA: MEMORIES on Steam! I won’t be doing game translation requests because the last time that happened I had to flail around for two years before completing it, haha. GIVEAWAY IS CLOSED. The winning number is 7! aki092 (6) and aika chan (8) are our winners! ♪(*⌒ｰ⌒)o∠★:ﾟ*PAN! Can you imagine that it’s been two years already? Wow, time flies… Especially when you look at my blog and you realize that there hasn’t even been that many posts since last year? Oops, I really need to do something about my speed //sobs. But my motto has always been “slow and steady” (at least in regards to this blog). It’s better to keep up my average speed like this than to try and rush out reviews and just burn myself out from otome games, don’t you think so? Anyway, I should get to the point of this post. Once again I want to thank all of you so much for continuing to follow this blog! So here’s a big thank you to all of my old and new followers ♥～(‘▽‘人). To be honest I was hoping I could finish Diabolik Lovers and Amnesia Later before it reached my second anniversary so that I could host another game summary giveaway but… yeah, as you can see, not happening unless I get a time machine ヾ(:3ﾉｼヾ)ﾉｼ. Instead I’ll be making this a drama CD translation giveaway and feedback post. EDIT: As of August 26, 12:06 PM PST, the giveaway is officially over! The random number generator spat up #32 and the person closest to that was shoujosei who had #36! I’ll get started on the request Jooubachi no Kanbinaru as soon as possible. Thanks to everyone who participated! I won’t close the comments this time so people can still give me feedback /o/. ‘Ello ello ヽ(*´ー`*)ﾉ! I just wanted to inform all my blog readers that I’ll be gone for a month on a short vacation. I’ll be visiting Taiwan and Japan, so there won’t be any updates during that time. I was planning on having something queued up for the month of May, but I couldn’t finish anything on time… sorry _(:3」∠)_.
I’ll be gone from May 5th to May 29th. I’m not sure how much time I’ll have for the internet while I’m out traveling and being on vacation so I’ll apologize ahead of time for the lack of comment replies during that time. I’ll edit this post and title when I get back to let you guys know when I’m properly home. As always, thank you all so very much for continuing to stick with me and my turtle-speed blogging! Please take care of yourselves and have a fantastic summer! Hello! It’s been a while since we last did a podcast and we were both taken aback by the interest that people expressed in hearing more of these. I honestly thought that no one would really care to hear about us TL;DRing or derping around about our opinions /)_(\! Anyway, we thought it would be interesting to take a look at the recent surge of anime adaptations of otome games and how the different sides of the otome fandom were affected by it. Once again, I’m sure we missed a few points in here so I may supplement the bottom of this post with points that I forgot to include inside. Discussion is always welcome below so long as all the replies are civil and respectful! This entry was posted in Miscellaneous and tagged Podcast.